This post is sponsored by Royal Design Studio. Creating holiday art is so much fun! I also love that this DIY Glitter Reindeer Art can also be on display throughout the year, which makes it a great gift idea if you are looking to make something handmade for family or friends! 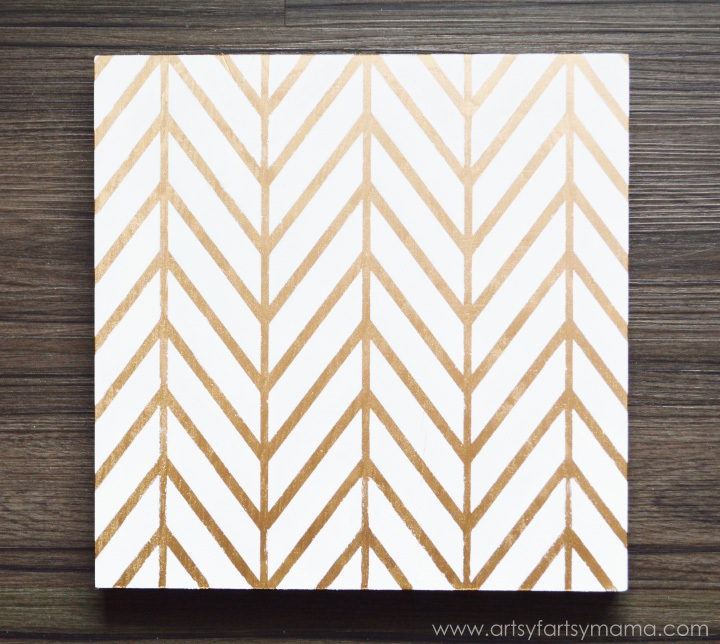 I love bringing patterns into my wall art, and the best way to do that is with stencils! There are so many different stencil designs at Royal Design Studio, that there is really something for everyone. One of my favorites is the Get Ziggy With It Christmas Stencil. What's great about herringbone patterns is that it looks great on both holiday projects or for dislpaying year-round! 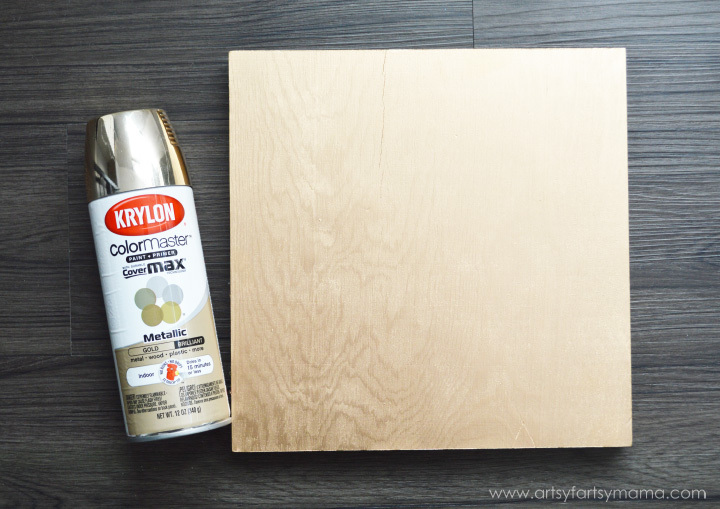 Spray the canvas with 2-3 coats of metallic gold spray paint. For best results, paint each coat lightly and let each coat dry completely before adding another. Let dry completely. I lined up the stencil with the canvas panel and taped it down with some washi tape since it's not super strong and will pull off paint. 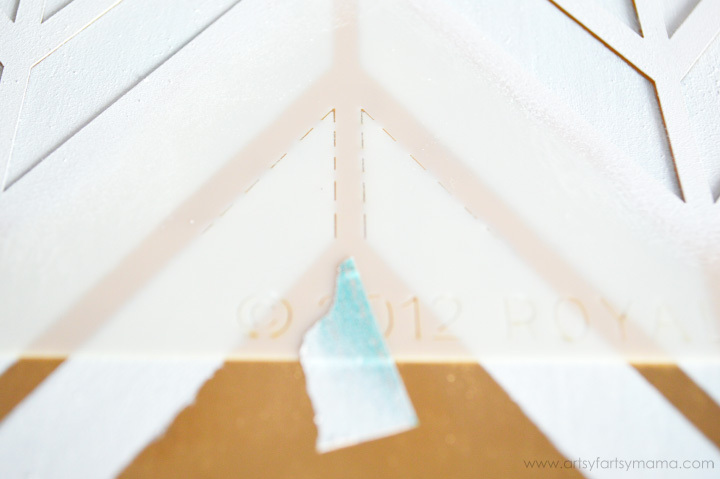 You could also use a light coat of spray adhesive to hold the stencil down. Nothing like starting to paint with a stencil and have it shift on you!! When it comes to painting with stencils, I'm the type of person who enjoys doing it, but I don't always have the best of luck. After trying a few different methods, the best advice I can give is to paint in light coats, and offload the brush on a paper towel before applying it to the surface to remove a lot of the excess paint that can/will seep under the stencil. I ended up painting about 4 coats. Once you're done with the middle section, you'll need to move the stencil to paint the upper and lower sections. The stencil has perforated guides to help make sure you've got everything aligned! 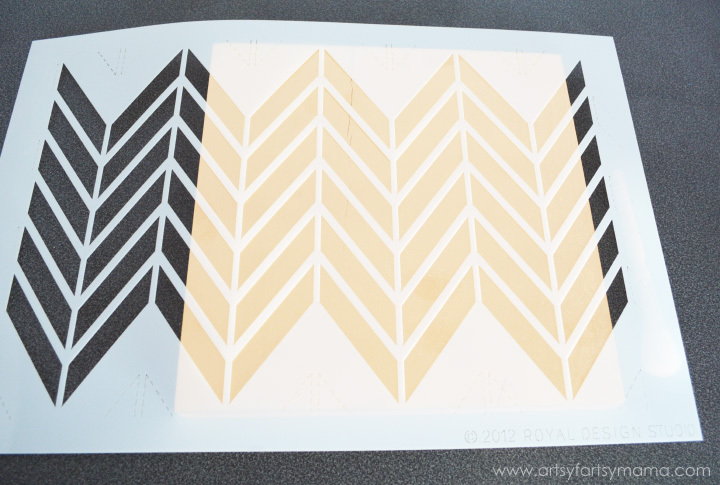 Re-tape the stencil down with the washi tape, and finish painting your pattern. Just make sure your paint has dried before you move the stencil on top of it!! If you happen to have any paint bleeds, you can fix it!! I just carefully used my fingernail or an Xacto knife and lightly scratched the paint around the edges and it all worked out fine. You can also touch up areas with a small paint brush. To make the reindeer, I cut out two reindeer images out of thin chipboard with my Cricut Explore. 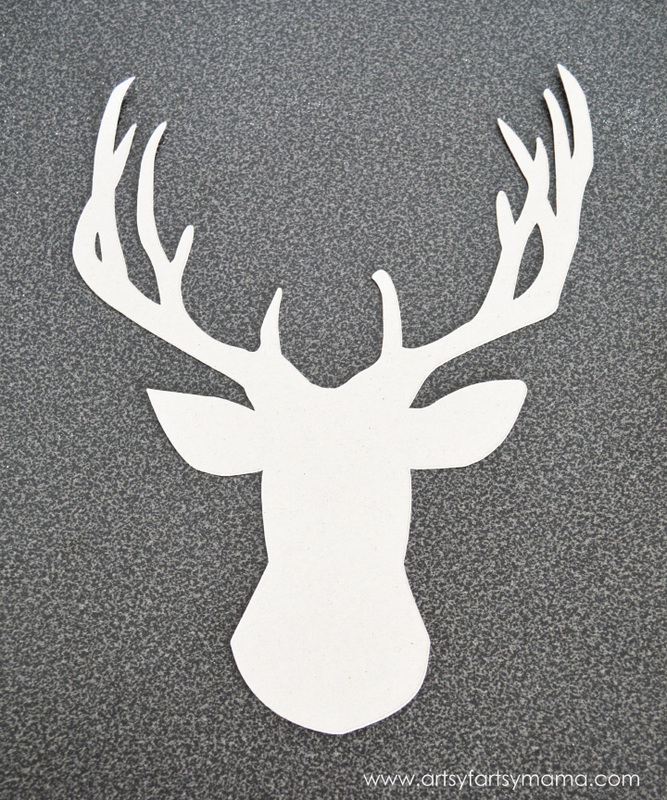 Spray the front of one of the deer with spray adhesive, then carefully lay the other on top. This will thicken up the chipboard (or just use thicker chipboard to start with) and make it a little more durable. Even though the deer is about to be covered in glitter (yay! ), it will look best if the background is at least a similar color to the glitter (in this case, black). Keeping in mind that chipboard is like a thicker cardstock, I didn't want to load it up with paint. That would cause all kinds of problems, like making the paper wavy or bubbling. So, I colored the deer with a black Sharpie marker and let it dry. Easy enough, and it gave me a good excuse to play with markers!! For the same reason as not using paint, I didn't opt to use Mod Podge or liquid glue on the deer. I simply sprayed a light coat of spray adhesive on top of the deer, and then placed it on a scrap piece of paper. Pour the glitter all over the deer and let sit for a minute or two. Then, I like to lightly tap my finger across the whole deer and kind of press the glitter in to make sure everything is sticking. Carefully stand the deer up and tap off the excess glitter. You can reuse the glitter, so roll the paper up and funnel the glitter back into its container. 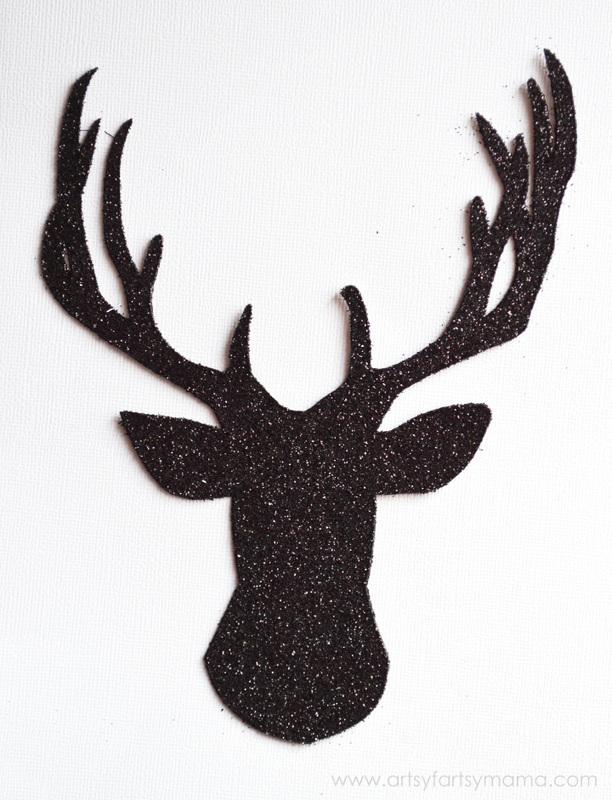 Then, spray the deer with some clear spray paint to seal in the glitter for a mess-free design!! Figure out where you want the deer to be placed, and attach it to the wood canvas panel with some E6000 or hot glue. Now your Glitter Reindeer Art is ready to display or give as a gift this holiday season! I absolutely LOVE this, Lindsay! The background makes the piece! I love this deer art Lindsay! I'm kind of deer-crazy this year for whatever reason. This is so stinkin' cute! 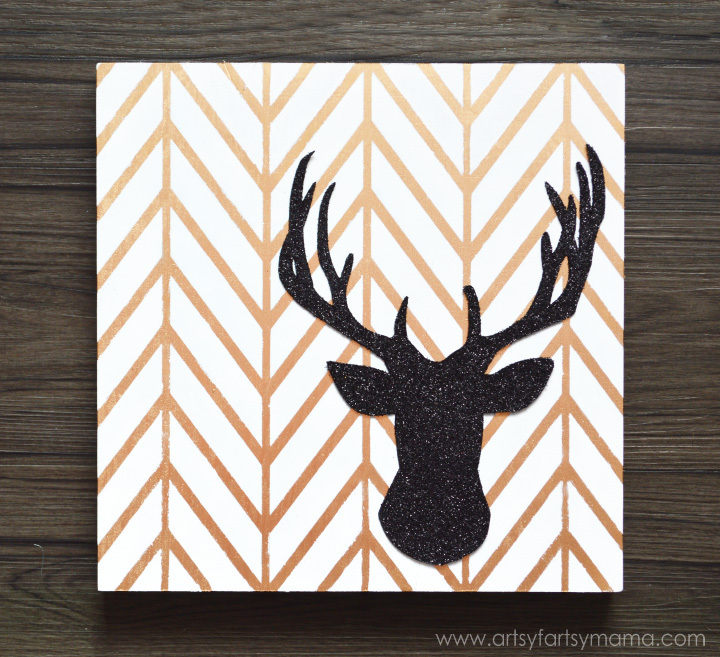 I love this project so much: the gold, the herringbone, the deer! Totally drool-worthy! I'm all about simple decor for the holidays...love the glitter for the reindeer head!! 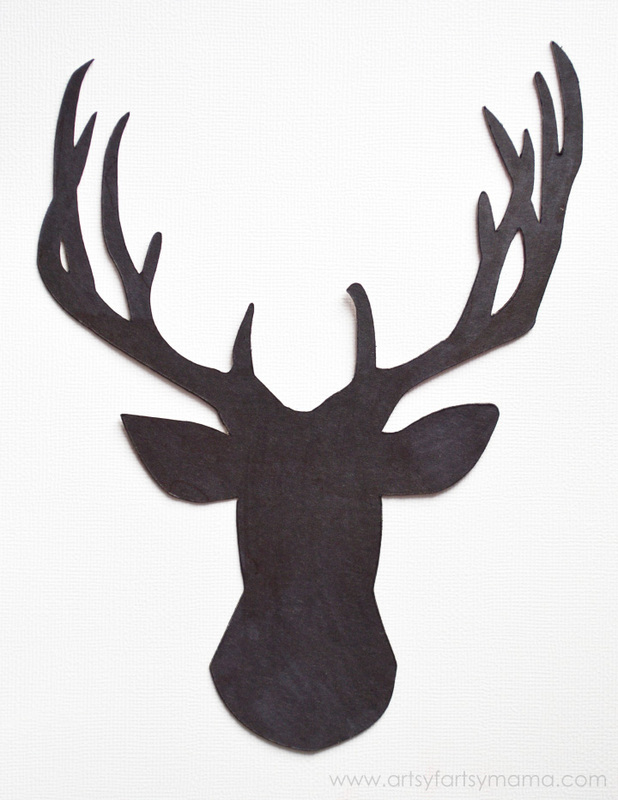 I really like all kinds of deer crafts! This is adorable! I just love how it turned out. Herringbone AND a deer silhouette?! I'm in love. This is going on my project list! 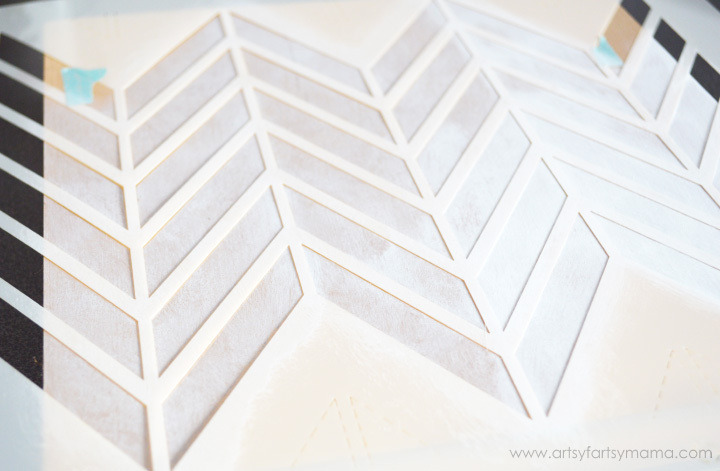 Thanks for sharing that Royal Design Studio has herringbone stencils. I love their products and I've been looking for this pattern. This is ADORABLE! I love how easy it was! This is so cute! Pinning it! You know I love me anything glittery, especially during the holiday season! So fabulous! Cute project! I have that stencil...Now I need a Cricut so that I can make my own version. super cute!! I love glitter... Just got a silhouette, so I can try projects like this now!! I love it, Lindsay! It's so chic, but festive at the same time! The herringbone is awesome! I love this! Simple but stunning! Great job! I love this!! I am quickly becoming a huge glitter fan! 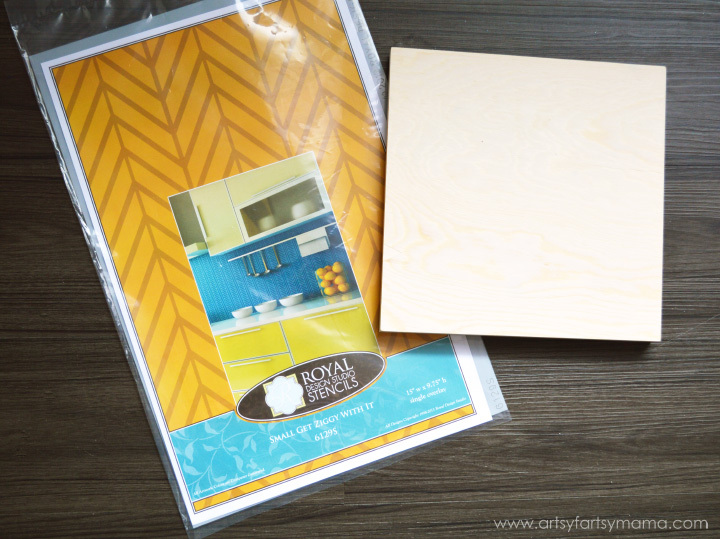 Do you buy the stencil directly from Royal Design or do they sell them in stores too? Thanks so much for sharing with us at Talented Tuesdays, I'll be featuring you this week! I sure hope you link up more of your great projects. This is so cute, I'm kind of obsessed with the deer silhouettes! Thanks for sharing this at Talented Tuesday link party! I can't wait to see what you share with us next!